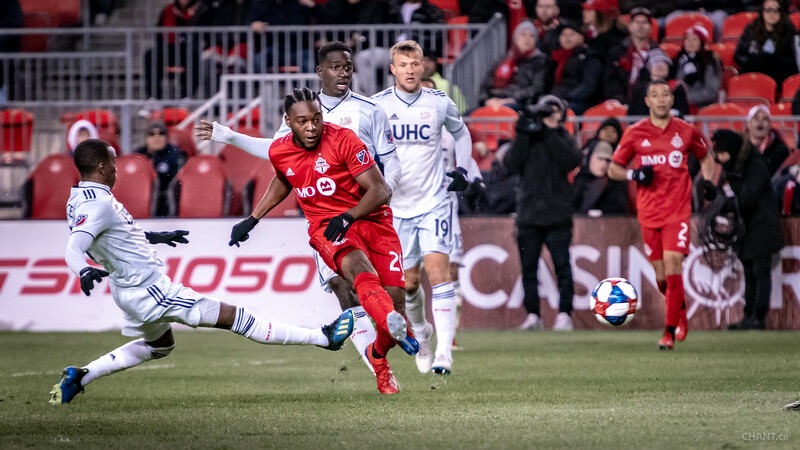 Toronto FC defeated the New England Revolution 3-2 on Sunday night at BMO Field. The Reds were coming off an early bye week after winning their season opener 3-1 in Philadelphia against the Union. Nine of TFC’s starters were either Canadian or American, and they are the only team this season to play a front six with midfielders and forwards from only North America. The only two players from the starting XI who are not from North America are defenders Auro Jr. (Brazil), and Chris Mavinga (born in France but of Congolese descent). New England started on the front foot as Teal Bunbury won a penalty after being taken down by Mavinga in the 8th minute. Carles Gil became the Revolution’s record signing after joining during the offseason from Deportivo la Coruña for a fee of $2 million. Gil converted the penalty in the 9th minute by placing it into the top right corner as TFC goalkeeper Alex Bono guessed the wrong way. The home crowd only had to wait five minutes for a response from their side, with 19 year-old MLS debutant Ayo Akinola tying the game at 1-1. Akinola weaved his way through a couple New England players before curling a shot past the keeper. Toronto made it 2-1 in the 45th minute to give them momentum going into the second half. Scarborough native and birthday boy Jordan Hamilton who turned 23 on Sunday tapped in a Jay Chapman cross. There were complaints from New England head coach Brad Friedel as he believed Jay Chapman was offside when the ball was passed to him, although Revolution defender Antonio Delamea made a play towards and interacted with the ball which meant Chapman was onside. Carles Gil scored his second of the match in the 52nd minute when his scuffed shot went through two Toronto defenders and in to make it 2-2. Jozy Altidore signed a new contract with TFC in late February that sees him through until the end of the 2022 season. He has praised the city of Toronto and wants to end his career here. Altidore came off the bench in the 68th minute and scored the game winner in the 80th. Justin Morrow provided the cross and Altidore did what he does best, finishing his chances. Toronto FC’s next game is at home on Friday, March 29th at 8 p.m. against New York City FC. Featured image from David Chant.